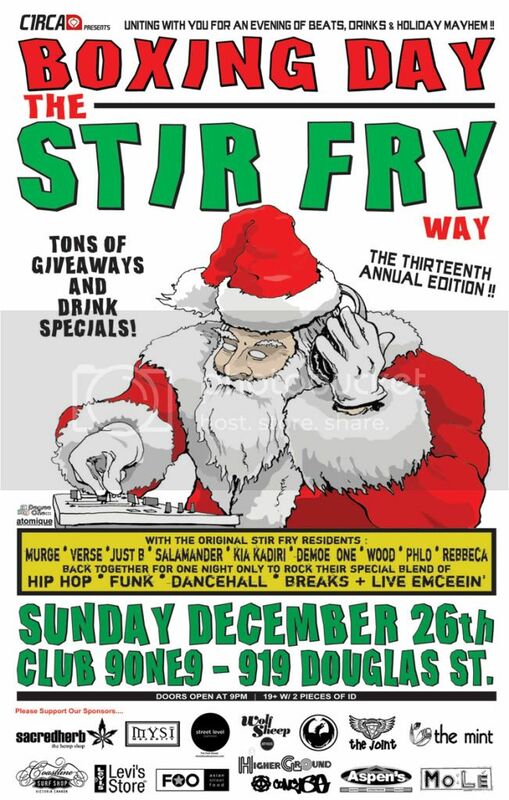 Degree One Events: Boxing Day The Stir Fry Way.. 13th Annual Edition. Boxing Day The Stir Fry Way.. 13th Annual Edition. Believe it or not.. THIS IS THE 13th ANNUAL STIR FRY BOXING DAY PARTY !! Uniting with you for an evening of Beats, Drinks and Holiday Mayhem the original Stir Fry residents rock up the realness and drench you in liquor!! Featuring the city's craziest sound and light system, a ton of drink specials and the coolest people around.. come find out why th...is is known as Victoria's biggest and baddest Boxing Day Bash. Hip Hop, Dancehall, Electro, Funk, Breaks, Mash-Ups and Live Rappin with the incredible, original Stir Fry line up... DJ's Murge, Verse, Sam Demoe, Wood, Salamander, Phlo and vocalists Just B, Kia Kadiri and Rebecca Shoichet. Drunken Santa will be in the house... He's finally finished up all his X-Mas duties and ready to UNWIND..!! He'll be carrying a big sack and giving a bunch of stuff away courtesy of our awesome sponsors.